In the Freedom Barometer Asia 2010 the Philippines takes 8th place (out of 16), just behind Malaysia but before Thailand. The Philippines score (out of 100 points) is 52.59. This compares to 78.89 for the freeest country (Japan). The Freedom Barometer Asia 2010 was published this month by the FNF Regional Office for South and South-East Asia in Bangkok. 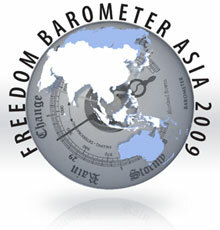 The Freedom Barometer Asia is an attempt to measure freedom in all its complexity in selected Asian countries. In contrast to most others indices, it is not limited to one aspect of freedom, be it political or economic. The Barometer combines the most significant elements of economic and civil/political freedom with a specific liberal perspective. The existence of the death penalty, for instance, counts as a negative element of a society’s existing political and legal order. Therefore the barometer “discriminates” against countries who practise capital punishment. In 2009 the Philippines also occupied the 8th position, albeit with a slightly higher score (56.34). According to the 2010 Barometer the position of the Philippines is stable because “…the Philippines have a tradition of freedom and civil liberties” and “…press freedom and freedom of expression are generally a given and government censorship is not a major problem”. However, a problem was particularly “…the killing of 29 journalists” in the Maguindanao massacre, but also other aspects such as “…high tariffs; import and export restrictions; access barriers to the Philippine service market; opaque customs valuations; rampant corruption; and a weak intellectual property rights regime”.